KIEV, Ukraine -- Ukraine's army chief of staff on Saturday listed for the first time some of the specific Russian military units alleged to be fighting against Kiev alongside pro-Moscow separatists in eastern Ukraine. 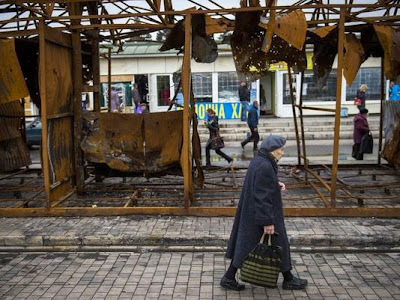 People walk past shell damaged stalls at a market by the railway station near the frontline in Donetsk, on April 18, 2015 in the self-proclaimed Donetsk People's Republic (DNR). Detonations from shelling are still heard with regularity around the station and airport area in the city despite a ceasefire deal aimed to end a year of fighting that has killed more than 6,100 people. "Regular Russian army troops are still in Ukraine" despite a ceasefire agreement signed in February which ordered the withdrawal of foreign fighters from the front, Viktor Muzhenko said in an interview published by Ukraine's defense ministry. Russia has repeatedly denied claims by Kiev and the West that it is arming and sending troops to help separatists who have gained control of parts of the east. Muzhenko insisted: "We have details of all the Russian units, where they are deployed, their numbers and their weapons," he said. He named among them the Russian army's 15th Mechanized Infantry Brigade, the 8th Mechanized Infantry Brigade, the 331st Airborne Regiment and the 98th Airborne Division. He said he had "proof" that Russian regular troops had fought in three clashes in the east in February, including a fierce battle for the rail hub town of Debaltseve, which is now controlled by the separatists. France and Germany brokered the ceasefire agreement on February 12 but heavy arms fire at the front between Ukrainian government and pro-Russian forces is still rumbling on in the east. The year-long conflict has killed more than 6,100 people, according to the United Nations. Despite the West's repeated allegations, no definitive measure of the scale of alleged Russian involvement in the fighting has emerged. Moscow has said any Russians involved must be volunteers who have gone to Ukraine without state backing. However, independent military experts say there is considerable evidence of highly sophisticated weaponry being used on the rebel side and other signs of professional involvement in what bills itself as a homegrown insurgency.